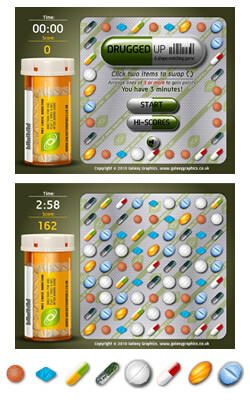 Symbol matching Flash game: ' Drugged Up' by Galaxy Graphics. The gameplay for Drugged Up is not unlike another popular web game featuring jewels. Click any two symbols to swap them over with the intention of making lines/chains of three or more symbols. The more symbols you can chain in one combo, the more points you'll get. In addition to being able to change all of the graphics, it's also possible to change the size and location of the gameplay area, the number of symbols per line, the number of possible symbol types and the gameplay time and points awarded. Drugged Up also includes a built-in leaderboard displaying the top 50 laptimes on the game's hi-score screen, using a database with PHP. The source code is also available for this game. In addition to the main gameplay the source code incorporates the standard Galaxy Graphics game framework, which includes sitelock code, a swear word filter and secure encrypted hi-score submission. For more information on the source code, contact us.